We are a large-ish comprehensive school, situated in a market town in a semi rural area outside Cardiff. We are one of the most successful schools in Wales and achieve some of the highest exam results across the country. We have about 1,450 pupils and 75 full time equivalent teaching staff plus additional support staff. 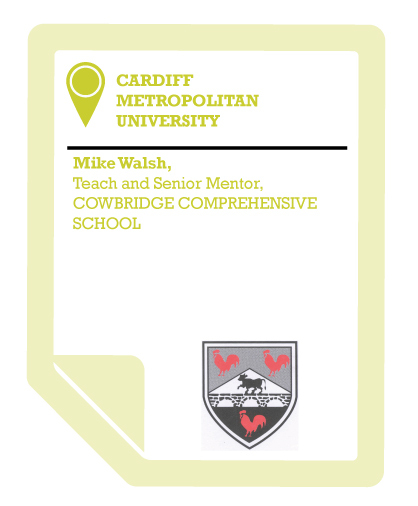 We’re also a partner school with Cardiff Metropolitan University (CMU) for their provision of teacher training particularly through their PGCE. The students we take on are with us for extended placements, they’re teaching our students and they’re involved and working with all aspects of the day-to-day life of the school. The quality of Cardiff Metropolitan University students and the support from the University really stands out for us. As a school we believe we have a responsibility to help prepare teachers and we also see it as a way of growing and developing the teachers we have in school. CMU is realistic but interested in the school’s needs as an employer and is very proactive in meeting these needs. CMU students really know their stuff, they throw themselves into the whole experience and are resilient in the face of the demanding pressures of the job. Probably my favourite moment of working with CMU was one teacher (who’s actually now employed here) who came to us on a first teaching placement. Towards the end of the placement (she’d been teaching for about 3 months at this stage) I went to observe her teach a low-ability group of 14 year olds as part of assessing her progress. She was teaching them English Grammar on something like a Thursday afternoon. I remember sitting there in awe of this woman because she was getting a not very bright class of teenagers to be desperate to learn more about grammar. I honestly sat there amazed by it. I was talking to her yesterday as she is now a mentor for CMU students when they do placements with us and she’s now trying to get that same standard that she set through to the current set of students. A couple of years ago we advertised for some maths teaching jobs. We got applications in, including quite a few from CMU; a shortlist was made for interview and there was a student from CMU who wasn’t shortlisted. When the maths tutor from CMU heard that, because of the relationship with the school, he called us and told us we had made a mistake and we needed to interview this particular student. We invited him for interview, because we trusted CMU’s opinion and ended up offering him a job. He was an absolutely brilliant teacher and has already been promoted to second in department at a very successful school in Cardiff. Usually that job needs more experience than he had. But he was given the job because we interviewed him on the recommendation of CMU. Because of the partnership we have with the tutors involved in the training we trusted their opinion. We get a number of things out of working with Cardiff Metropolitan University, I think: we get people coming into the school with new ideas and enthusiasm who will contribute to the wider work of the school; we get kept up to date with some of the latest ideas in education because of that cross fertilisation of ideas and discussions with tutors and students; and we get the chance to see some potential staff who have gone on to secure jobs in the school. CMU delivers employable students. Because we’re quite a successful school and well known in South Wales for that, when we advertise a job we get a large response and teachers have to stand out to get a job here. We can be picky with who we recruit and we often choose to recruit from Cardiff Metropolitan University.